Astrid: The Next time you and your friends jump me, I'll cut your throats when you're sleeping. A scene where Astrid defends her brother (in the first foster home) after Starr beats him up. A scene immediately after featuring Astrid and her brother (still in the first foster home) lying to the parademic asking how he broke his arm. A scene where Claire can't decide which cereal they want to eat for breakfast and makes Astrid choose one. A scene featuring Claire and Astrid riding home in the car after visiting Ingrid (Michelle Pfeiffer). Claire tells Astrid what Ingrid told her. A scene where Astrid is drawing Claire's picture and Mark asking Astrid if she took his pen. A scene where Astrid leaves to go back to Mac. Mark asks Astrid if she wants to go to Claire's funeral in which she declines to. He then gives her a lot of money before getting to the van. It's been a while since I've seen as good a job at depicting the effects of a strong but flawed mother on her strong but impressionable daughter. In the first home, Robin Wright Penn's fundamental Christian presides over a frenetic household but reveals the sweet chaos of people who really love each other. In the next home, vulnerable actress, foster mom Renee Zellweger brings intimate caring to Lohman at an emotional price. Russian rag picker Svetlana Efremova brings hard-nosed business into Lohman's sights to complete an education of survival. Lohman finds loving understanding with Patrick Fugit, another artist in her life, but one without an agenda. It's been a while since I've seen as good a job at depicting the effects of a strong but flawed mother on her strong but impressionable daughter. `Divine Secrets of the Ya-Ya Sisterhood' tried with Ellen Burstyn as mother and Sandra Bullock as daughter, but the film failed to engage beyond a few shouts and eccentric southerners. 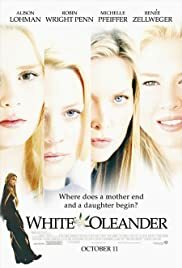 `Oleander' has a brilliant artist manipulator teaching her daughter to be independent, even cold, to survive, yet the daughter has a need to be loved that draws her to older men, Christianity, and rebellion. Her psychic search for her absent father serves only to exacerbate the matter. Pfeiffer does her best work here-- beautiful even in prison, she plays an ugly soul capable of the worst emotional tyranny over her sensitive, intelligent daughter, played with heart-breaking insight by Lohman. I was pleased with Kirsten Dunst last year in "crazy/beautiful." Just substitute Alison Lohman this year.